"41HS3, Extra-7" by Timothy K. Perttula and Robert Z. Selden Jr.
DECORATION (INCLUDING MOTIF AND ELEMENTS WHEN APPARENT): The interior and exterior vessel surfaces have a red clay slip. The rim has upper and lower horizontal engraved lines with excised pendant triangle elements, and a central horizontal engraved line without pendant triangles. The central horizontal engraved line is connected to two sets of engraved diamond elements (with an inner diamond), and these alternate with circle elements offset from the central horizontal engraved line by upper and lower excised brackets. The circle elements also have an inner diamond-shaped zone. Ripley Engraved, var. 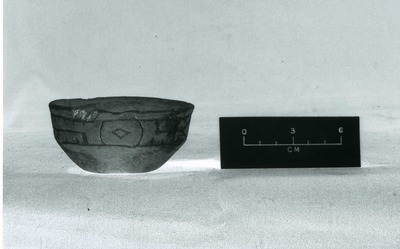 McKinney miniature carinated bowl, Extra-7, H. R. Taylor site.